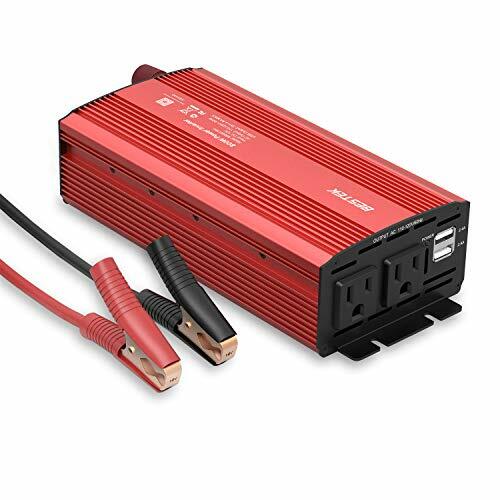 【BESTEK Advantage】America's Leading Power Inverter brand on Amazon. Provides 800 watts continuous DC to AC power and 1600 watts of peak power. 【Dual 110V AC Outlets】 Dual 110V AC outlets deliver 800W continuous power to your refrigerator, coffee maker, desktop, laptop, TV, game console, DVD/Blu-Ray player, microwaves, pumps, and other electric appliances. 【High Speed USB Charging】 Dual USB ports Auto 0-2.4A /per port, can automatically identify USB devices and deliver the optimal charging speed. 【Multi-Protection】This power inverter is equipped with overload and low-battery shutdown features to protect your electric appliance safe. 【How to Use】Hook up the power inverter to your vehicle battery with the battery clips to get Max 800W power AC output,ideal for outdoor emergency charging,road trip and camping power supply.